Cardiff made it through to their first Cup Final since 2007 as they controlled the game against Llandovery. Joey Tomlinson led his side out onto the Gnoll as he marked his 100th game for the Blue & Blacks, and in the Neath sunshine it was the skipper who got the scoreboard moving. Edd Howley broke through the Drovers defence to link with Ben Thomas. The centre timed his inside pass perfectly to send Tomlinson over. Gareth Thompson converted and was on target a few minutes later after another Howley break nearly led to try number two. When that was snuffed out the Cardiff back row forced a penalty that the outside half landed for a 10-0 lead. Jack Maynard got the Drovers going with a long-range penalty but Cardiff were in the mood to run and when they ran at Llandovery from a scrum the ball was worked to the left before coming back the other way. Joe Gatt found room to run at the defence before sending Morgan Allen over. And it got even better when try number three arrived. This time the other wing Max Llewellyn the provider of the scoring pass following great work from Ben Thomas. Edd Howley the scorer. Llandovery got their first try just before half time when Rhodri Jones went over for a score Maynard converted to send them in 20-10 down. 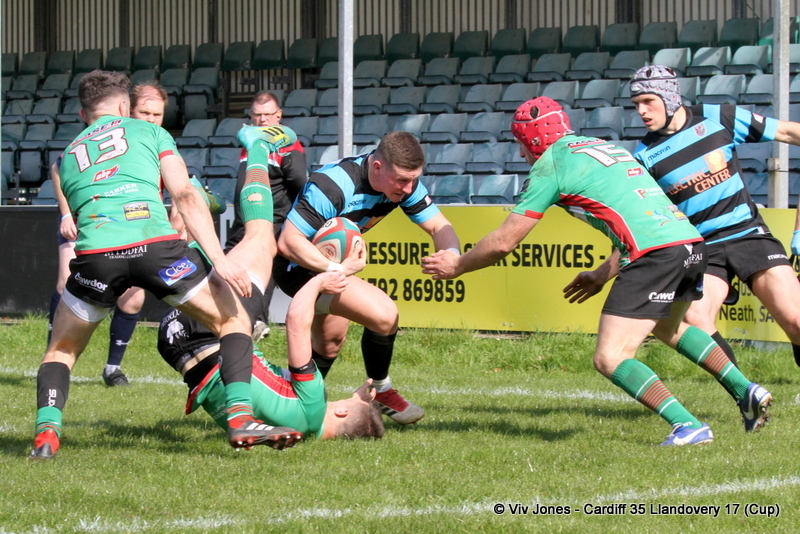 The second half saw Cardiff increase their advantage when a mistake by the Drovers defence put Cardiff on the attack. Eventually the ball was worked to Howley. The full back still had a bit to do, but managed to squeeze over. Llandovery then had their best spell of the game. Lee Rees got reward for their effort, but the Cardiff defence withstood everything that was thrown at them, and when a five metre lineout was pinched and the danger cleared the Drovers heads seemed to go down. Cardiff could have killed off the game shortly after, three chances going astray. But they were not to be denied. Thompson added a penalty to stretch the lead and as the clock ran down Llandovery tried to run from deep. Thompson though was alert to it and picked off the pass to score and spark scenes of celebration for those in Blue & Black on and off the field.